Telopea is located at the edge of the delightful village of Woodbridge. 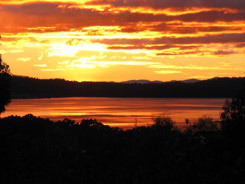 Set among five acres of gardens and natural bushland on a hill overlooking the D’Entrecasteaux Channel and Bruny Island, Telopea’s two fully self-contained Units offer you comfort, privacy and convenience. 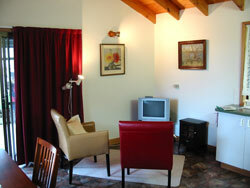 You will love the peace and serenity of the location, and be delighted by the natural beauty of the area. The views from and around Telopea are always captivating and the area provides for some delightful walks along quiet country roads and along the Channel foreshore. 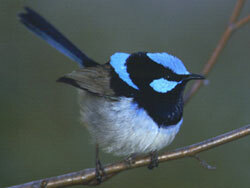 Your stay at Telopea will almost certainly reward you with sightings of some of Tasmania’s unique native wildlife. 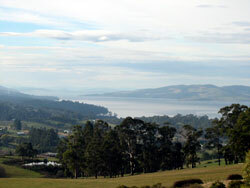 Telopea provides you with a comfortable overnight stay, but is also a wonderful base for touring the many attractions of Bruny Island, the D’Entrecasteaux Channel and the Huon Trail. Substantial breakfast provided for the first morning of your stay. BBQ facilities are available for your use. Evening meals by arrangement. 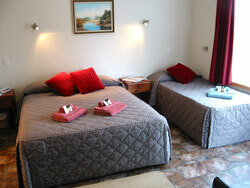 Unit 2 consists of a main bedroom with queen bed, and a second bedroom with 3 singles. 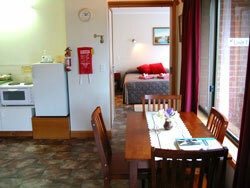 Unit 1 features one bedroom containing a queen sized bed. 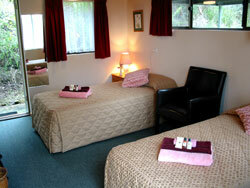 All beds at Telopea have an electric blanket and your choice of blankets or doona. 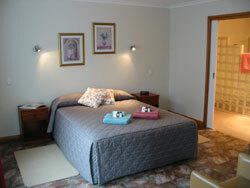 For Tasmania’s cooler evenings your Unit has underfloor heating, as well as an electric fire.